Over the next two weeks, New Yorkers will notice quite a few unusual things happening around the city: passersby cleansing the feet of black clothed figures; young, smiling mothers devouring life-sized, edible babies; a woman wrapping herself burrito-style in brightly colored cloth; dirty sidewalks strewn with carefully placed rose petals; and much more. Welcome to Art in Odd Places 2011: RITUAL, a ten day festival during which over 60 artists will display the spiritual, social, political and everyday significance of rituals along 14th Street. “My hope is that pedestrians have an ‘aha’ moment where they rethink their patterns of travel and behavior even for a brief second—instigated by one of the ‘rituals’ encountered along the street,” Woodham commented in an email. Lucia Warck Meister, this year’s festival producer, was looking forward to seeing the public’s reaction to the festival over opening weekend. Friday was the opening reception of the festival at Theaterlab. Mustachioed artist LuLu LoLo greeted visitors at the entrance in a top hat and tails. Reggae music of Turkish performer Egemen Sanli floated down the stairs of the small, brick building. As the sun set, Australian artist Bindi Cole began tossing feathers from the roof of the building as part of her The Shelter Under the Shadow of His Wings project. Down below, Sherry Aliberti’s brightly colored Cocoons appeared. Covered from head to toe in blob-like, stretchy material, Aliberti’s performers began their contorted dance down 14th Street to gather at Hudson River Park by sunset. By 7 p.m., AiOP artists performing their rituals in the street had drawn quite a crowd of curious visitors. “ ‘Rituals’ is a good theme because they generally involve group activities and community, and that aligns really well with the purpose of the festival,” Devon Walsh, the festival’s administrative assistant, said. The purpose of the festival encompasses more than simply displaying unusual art. Woodham began these festivals to react to the disconnect he saw developing between individuals and their awareness of public space. But really, how could any pedestrian remain complacent toward artists Anya Liftig and Caitlin Berrigan, for example, who walk along 14th Street devouring what seem to be blanket-wrapped babies? Liftig and Berrigan’s project, Adoring Appetite, is meant to explore the obsessions, myths, and terrors of motherhood—through cannibalism. Berrigan and Liftig also hope to bring attention to the pressures women face around having and raising children. Next year, Woodham and his team will continue to stretch the boundaries of art and utilize public space to its fullest, hopefully expanding out of the annual festival. “I see the concept of Art in Odd Places moving beyond the yearly festival with programming throughout the year in different—odd—areas of the five boroughs,” Woodham commented. The word for 2012: “model,” encompassing artistic expressions of fashion, prototype, pose, imitate, plan and system. 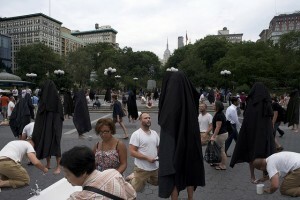 Art in Odd Places 2011: RITUAL will run from October 1 to 10 along 14th Street from Avenue C to The Hudson River. Look for daily performance schedules and more information at www.artinoddplaces.org.